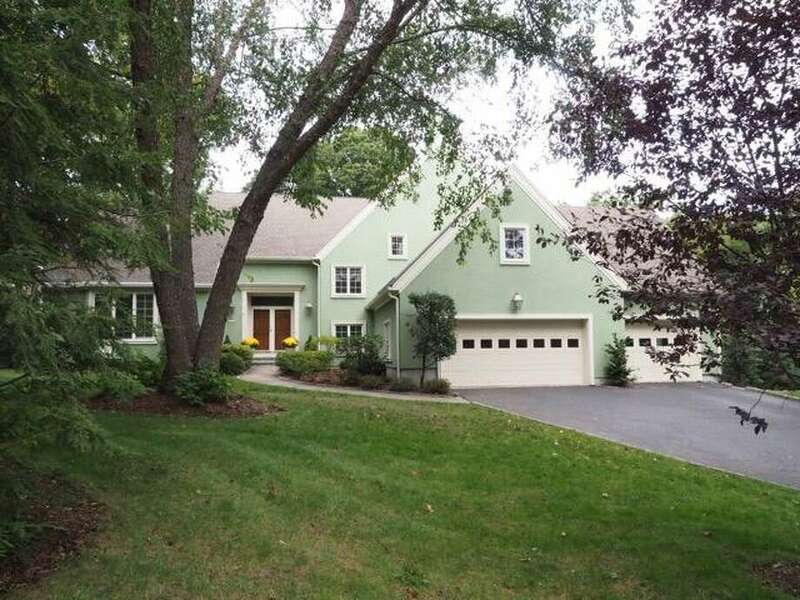 The pale green stucco colonial house at 14 Bates Farm Road sits on a half-acre level and sloping property at the end of a private cul-de-sac in a quiet setting close to town, train and municipal parks. DARIEN — This week’s summer solstice brings with it more opportunities to enjoy the outdoors and the pale green stucco colonial house at 14 Bates Farm Road affords its owners more than its fair share of recreational amenities. The house sits on a half-acre level and sloping property at the end of a private cul-de-sac in a quiet setting with only seven other houses on the street, and it has its own heated Gunite in-ground pool in the backyard; a great place for swimming, relaxing, and entertaining. Within easy walking distance is Cherry Lawn Park and Tilley Pond Park. Also nearby, although not walking distance, are Tokeneke Park and Weed Beach on Long Island Sound. Cherry Lawn Park comprises 27.5 acres off Brookside Road and offers passive and active recreational opportunities including tennis courts, a basketball court, community gardens, a playground area, walking trails, and several picnic areas. The Darien Nature Center is housed in the park. Commuters, take note. This is a great location because of its proximity to Post Road (Route 1) and I-95, walking distance to the Metro North train station, and short drive to the Merritt Parkway. In other words, this house is located in an ideal place for living, working, and leisure pursuits. The great room contains the family room, gourmet kitchen, and breakfast room. The family room has two walls of tall windows, a red brick fireplace, and a door to the deck. In the kitchen the features include a large square center island topped with granite, glass-front cabinets, double porcelain sinks, and a prep sink on another perimeter counter. High-end appliances include a Sub-Zero refrigerator. The breakfast room has three walls of tall windows and three skylights. Additional casual dining seating is available on the center island breakfast bar. Off the kitchen is an office and a back hall with a mudroom, large walk-in pantry, powder room, and laundry room with counters, cabinetry and utility sink. There are five bedrooms in this house, the master suite on the first floor. It has a vaulted ceiling and ceiling fan. The master bath has a hardwood floor, two walk-in closets, deep jetted tub, L-shaped vanity with two separate sink areas, and a water closet with a bidet. On the second floor there are three bedrooms, all of them en suite. One of these bedrooms is large enough that it could serve as a master, should the next owner prefer the second floor. That would leave the first floor master as a large guest or au pair suite. In the full finished, walk-out lower level there is 1,167 square feet of additional living space including the fifth bedroom, full bath, large media, play or exercise room with built-in bookshelves, a large storage area, and a clever toy “closet” - a room with walls of deep built-in shelves for storage of toys and games. Above the three-car garage there is a large storage are that could be converted into useable space as an in-law suite, home office or art studio. It has a separate entrance. There is a full house generator that automatically turns on if the power goes out. There will be an Open House on Sunday (June 25), noon to 2 pm.